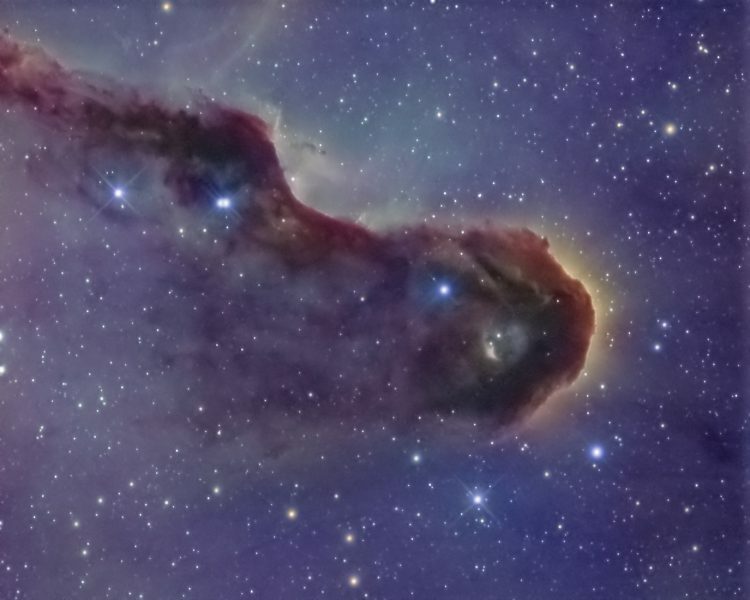 IC 1396 is a large emission nebula in Cepheus. A widefield image can be found here. This image zooms up on an interesting feature found in the widefield at about “9:30” — it’s known as the “Elephant’s Trunk Nebula”. Widefield data (3.5″/pixel) was acquired at MYHY Observatory in the Philadelphia suburbs during the fall months of 2018. I used an SBIG STL 11k with Astrodon 3 nm Ha and OIII filters, Takahashi FSQ 106, and Paramount ME. All subexposures were 30 minutes for a total exposure of about 36 hours. Processing was accomplished using: Maxim for data reduction; PixInsight for image alignment, integration, and initial data stretches; Photoshop (using a modified bicolor technique to synthesize the green channel from the red (Ha) and blue (OIII) channels. Finally, higher resolution hydrogen alpha data (0.4″/pixel) of the Elephant Trunk region from a 10″ RC was supplied by Robert Vanderbei, and I combined the 2 images, using the high res data as a “lum layer” over the bicolor data.